Some palettes are color mixing palettes. With this special palettes you can blend colors right inside the palette. 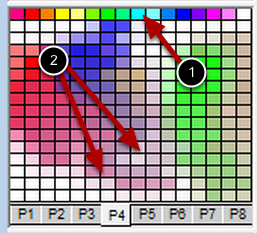 Click to select a color either from the top row or anywhere in the palette. Press and hold the Shift key and drag to blend colors in the palette. The top row will not blend. Note: To clear the palette you can reload it with the Load Palette menu item from the popup menu or use the Clear Palette menu item.